My paintings express my connection to the family farm. The abstracted landscapes are inspired by memories, imagination and observation of aerial views. Rich, vibrant color embellished by narrative, symbolic pencil and brush marks tell the story of my connection to the property that has been home to my family. I work in watercolor, acrylic and oil mixed with cold wax, but viewers often have difficulty telling them apart. Each of these mediums have their strength. The fluidity of water media allows me to work very spontaneously while the ability to build up texture and layers attract me to the use of oil paint. You’ll notice similar shapes, color and line work in all of my paintings. 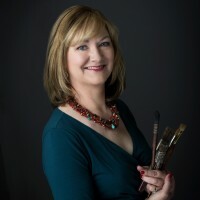 Ruth Armitage is a signature member of the National Watercolor Society , Rocky Mountain National Watermedia, San Diego Watercolor Society, Watercolor West, California Watercolor Association and the Northwest Watercolor Society, and Past President of the Watercolor Society of Oregon. The Watercolor Society of Oregon has awarded her its Outstanding Service Award. Ruth’s work has received many local and national awards, including the Loa Ruth Sprung Award in the National Watercolor Society’s 95th Annual Exhibition. Inclusion in numerous national publications and exhibitions has led to wide-spread recognition for Ruth. You may have seen her work profiled on Oregon Public Broadcasting’s “Oregon Art Beat.” Most recently Acrylic Artist Magazine ran a 10-page feature article in their Spring 2016 issue. You can find Ruth’s work in Portland at the Portland Art Museum’s Rental Sales Gallery. She is a gifted instructor and has juried several national, local and state exhibitions. She enjoys sharing the creative process in the classroom and watching lightbulbs come on in her students’ eyes. Read their comments about Ruth’s classes on her ‘Workshops’ page. Ruth and her husband Marc, both fourth generation Oregonians, maintain a small farm and studio in rural Oregon City.